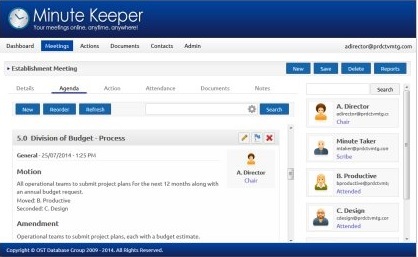 MinuteKeeper (Web) is a powerful yet simple to use Meeting Management System designed to provide companies and organisations with the ability to better manage, track and distribute meeting information. 24/7/365 access, anywhere with Internet connectivity (Internet based systems only). Ability to manage meetings, meeting agendas and minutes, actions, meeting templates, attendees and associated documents. Ability to transfer actions and agenda items from previous meetings into current or future meetings. Ability to view/search minutes, agendas, actions and recipients of previously held meetings. Generate reports to PDF format and distribute these reports to recipients via email. Ability to manage meeting schedules.